It seems like just yesterday we were finishing year end assignments. And yet, the store shelves are stocked with back to school supplies and I’m filling our school shelf with the books that we’ll use in the coming year. While I’m prepping for the start of a new school year, my kiddos are already bemoaning the haste with which our summer has evaporated. Get them excited about going back to school with these Notebook Paper S’mores. Notepaper s’mores make perfect back to school treats and or would make a great way to celebrate mid-terms, or even graduation! 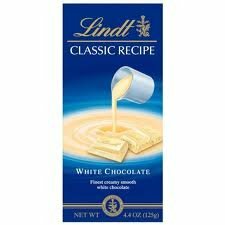 While you could use any white chocolate bar for this treat, I’ve found that the Lindt White Chocolate bars work best. They have the best taste, texture, and consistency! 1. Take a graham cracker square and spread about 1 tablespoon of marshmallow creme on it. 2. Place a piece of white chocolate on top and press down gently to even out the marshmallow. 3. On a microwave-safe plate, place the chocolate and marshmallow graham cracker in the microwave and heat for 10 seconds to allow the chocolate to slightly adhere to the marshmallow. Do not overheat or the white chocolate will begin to melt and lose shape. Let completely cool. 4. Use a single strand of a cherry pull-and-peel Twizzler candy and cut a 2 inch strand from it. Place the strand going down the smores cracker to resemble the red line in a piece of filler paper. 5. With the blue Wilton gel icing tube , squeeze 5 lines across the s’mores cracker to resemble the blue lines on a piece of filler paper. 6. With a black Wilton gel icing tube , add several “dots” going down the left side of the s’mores cracker to resemble the holes in filler paper. Are you asking yourself is homeschooling right for you? See how to choose a homeschooling curriculum (without losing your mind) and learn how to rock your first year of homeschooling! I’m off to finish my curriculum round up.